Hi @johnjohnston. Set up new WP class blog. Hoping to use translate function for an EAL ppl and family. See it mentioned but doesn’t appear? The mention Karl was mentioning came from the Suffusion theme which has just been retired from Glow Blogs. Or developers had warned us that they though there would be too much technical debt in supporting it in the long term. The Suffusion theme had given Glow Blogs many useful features, especially before the WordPress update at the start of this year. One of the features that folk found useful was a google translate widget. Ironically this was one of the things that started us seeing that the them would need a bit of TLC from the developers, they had to edit the theme to support serving blogs over https. Currently you cannot add a google translation widget to a Glow Blog, you can add a link to an automatically translated page for one language, and visitors can swap languages to that page. 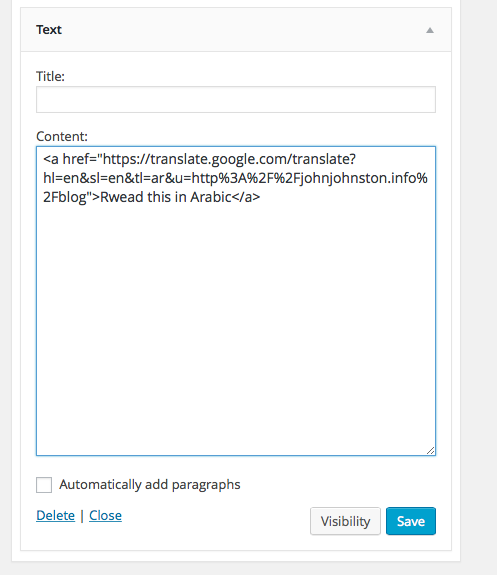 You could link to a google translate page using a text widget on the side of your blog. Go back to your blog and add a text widget to the sidebar. you now have a link on your sidebar to translate your page. I am obviously aware that it would be a lot simpler to have a translation widget that could be added to your blog and hopefully at some point we can have this. If you try this and have any difficulty please get in touch.